when I want to do something nice for them, I paint them something they would like. And last weekend was Big/Little Reveal! As a Big this semester, we gave little gifts to our Littles! This was just one of them! I'm a Big Fan of Musicals! and I think it came out great! This is a 8x14 canvas. of my old sheet music books, so I printed out "Do you hear the people sing?" I used Mod Podge to glue it to the canvas. It took two sheets to go the length of the painting. 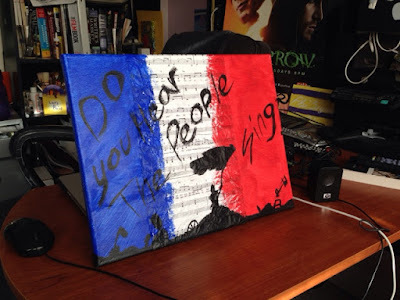 Once the sheet music was secured, I painted the canvas to look like the French Flag. 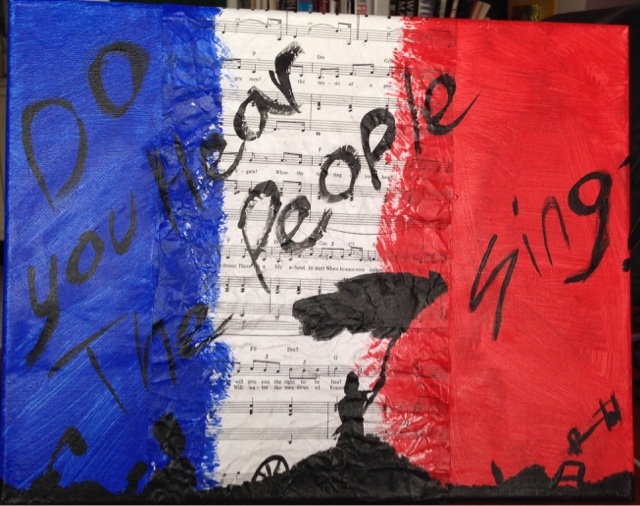 Then I painted a silhouette of that scene when they sang the song, and wrote the words above. I'm actually really happy with how well this came out. It's not perfect by any means, but I really like it!